We Love Days of Our Lives! This site is not affiliated with NBC, Days of Our Lives, or any soaps. We're just fans like you! We love to hear from you about our pages or the soaps, but please don't email us as if we know the actors or writers (because we don't!). Thanks! We have tons of new content in this section, so check it all out! Sign this petition to let NBC know you want the show to stay on the air! Happy Anniversary today to "Days of Our Lives!" Check it out - Photos by Norma (including some DOOL stars)! Vote for your favorite daytime and primetime actors in this weekly poll - it includes Deidre Hall and others! See the results on their Twitter feed. Find out where Days' past and present actors are appearing Live or in TV shows and movies! Get all the latest up-to-date cast news, comings and goings, on the Days Cast Page. Check out our Daily Updates and Daily Transcripts and Daily Short Recaps! Days of Our Lives Best Lines daily feature! 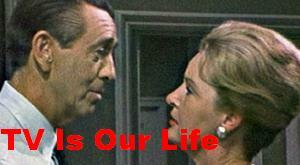 Days of Our Lives premiered on November 8, 1965, on NBC set in the fictional town of Salem. From Wikipedia: It is located in the Northeastern United States, though the state is never mentioned. It was built and named in 1802, since Salem celebrated its 200th anniversary in 2002. Originally set in New England, the vague setting was moved to somewhere in the Midwest in the 1970s. Every year the real Salem, Illinois, holds a Salem Days fest, which several members of the cast attend. Listen to your favorite stars' Podcasts. Don't forget to sign up for our NBC Soaps scoops newsletter to get the latest news about the shows! If you would like to volunteer to write scoops, fan fiction, or anything for our soap pages, or to write recaps for some of our other soaps. please email us. Sign the petition to make sure Days stays on the air! DAYS MAILING LISTS: (NOTE: We don't run any of these, so email at the addresses given, not to us! Superman79 is running an online and free "Days Of Our Lives" Newsletter. You can E-Mail him at Superman79@aol.com to receive it. JSweit8573 has an online and free "Days Of Our Lives" Newsletter out. Please E-Mail her at JSweit8573@aol.com for more information or if you would like to receive it.